Tesco has started modifying its supply chain following its takeover of wholesale group Booker starting with the fulfilment of 3,000 Booker products from its Magor distribution centre. Tesco’s first quarter trading statement shows sales growth of 1.8 per cent, UK & ROI growth of 3.5 per cent. Following the consolidation of Booker in March 2018 Tesco has had a sales growth of 14.3 per cent. 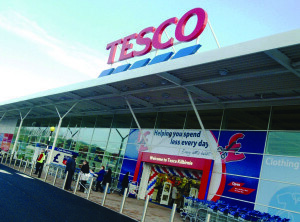 Tesco said its Booker ‘Joining Forces’ programme is now “well underway” with progress towards accessing new growth opportunities with supplier partners. It is also planning to use its Middleton distribution centre is to support Booker growth during the Summer trading period. Following a positive initial response to Booker Chef Central which stocks bulk items for caterers at Bar Hill, moving on to a second trial concept at Beckton Tesco express. Tesco has also extended the two-store trial of the top 30 selling Booker lines and is to introduce a similar range to over 50 stores. Earlier in the year Tesco made the decision to close Tesco Direct and will cease trading on 9 July 2018. Customers can now purchase products from Tesco’s online toys, homeware and cookware ranges to build on this offer and make use of a simpler online experience. Tesco’s Fenny Lock fulfilment centre, which handles the orders, is due to close as a result and 500 employees are facing redundancy. “This decision has been a very difficult one to make, but it is an essential step towards establishing a more sustainable non-food offer and growing our business for the future,” said Tesco chief executive Charles Wilson.